ALTON, Virginia – August 22, 2014 – Brad Jaeger of nearby Charlottesville, Va., who is studying for his Masters degree at the University of Virginia, will start ninth in the IMSA Continental Tire SportsCar Challenge race at VIRginia International Raceway tomorrow in the Doran Racing Nissan NISMO 370Z #14 that he shares with co-driver B.J. Zacharias of Cincinnati. Jaeger took just 1:59.311 to travel over the 3.27-mile, 18-turn road course while recording the car’s fastest lap during the 15-minute Grand Sport qualifying session Friday afternoon at 5:10 p.m. His best lap was the third of seven he turned, and it puts him in the middle of the 21-car Grand Sport class. 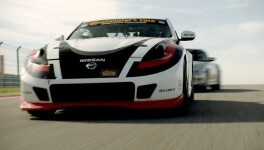 An additional 27 Street Tuner cars will also be in the 2.5-hour race, which begins at 2:05 p.m. Eastern time Saturday. Jaeger, who is fourth in the driver point standings going into this race, will start the race on the inside of Row 5 beside Tom Kimber-Smith’s BMW M3. His qualifying time was just 1.107 seconds off the pole, which was won by Jordan Taylor in a Camaro. Jaeger’s time was just 0.222 off fifth place and 0.337 of a second off third place in this very competitive series. Live streaming is planned for imsa.com, while the race will also be shown on Fox Sports 1 at 10 a.m. Eastern time Sunday, Aug. 31. The Lebanon, Ohio-based team is noted for its excellent car preparation, and its Nissan was fast right out of the transporter. It ranked third in the first practice session with a time of 1:59.626 (98.407 miles per hour), which was just 0.286 of a second off the fastest time in that 45-minute session that started at 8 a.m. Friday. Its fastest lap was the fourth of eight laps it turned in that session. The team was eighth in the second practice session Friday afternoon from 12:45 pm. to 1:30 p.m. with a 2:00.138 (97.987 mph) on lap 14 of 17 run. 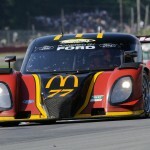 For more information on Doran Racing, see DoranRacing.com and the team’s Facebook page. The Facebook page has a link to an interview Jaeger did early Friday morning with Joe Thomas of Charlottesville, Va.’s WCHV/WKAV Radio. Brad Jaeger: “The car was good. We were right there with the majority of the top runners. I know the car had more in it; I was held up by traffic on the last lap. I don’t know where that Camaro’s time came from though. “Hopefully B.J. and I will have a good race tomorrow and bring it up through the field. We have to thank Doran Racing for giving us such a good car. “With the repaving and the widening of the track, the track curbing is much more useable. I’m enjoying it. “ST qualifying right before our qualifying session was cancelled due to rain; they’ll start by points. The track was drying during our session.